To Cite: Rasi A, Zamanian A, Mehran G, Ezati A, Rastin V, et al. Comparing the Effect of Injectable Vitamin B With Conventional Oral Treatment on Aphthous Stomatitis, J Skin Stem Cell. 2018 ; 5(1-2):e69052. doi: 10.5812/jssc.69052. Background: Recurrent aphthous stomatitis (RAS) is a common condition with recurrent ulcerations limited to the oral mucosa. Different predisposing factors have been proposed, including iron, vitamin B12, and folic acid deficiencies. The aim of this study was to evaluate the effect of injectable vitamin B in comparison with a form of oral therapy on recurrent Aphthous stomatitis. Methods: This randomized clinical trial was performed on 60 patients with RAS, during years 2015 and 2017. All patients were at least 18 years of age without systemic disease associated with RAS. All the study population had a minor type of Aphthous ulcers with two months of maximum recurrence intervals during the last year. Additionally, all patients benefited from a checklist, including demographic data and relapse intervals, and a number of lesions were completed before the start of the study. Also, blood tests were performed to evaluate a complete counting of blood cells, and levels of ferritin, vitamin B12, and folic acid. Next, patients were randomly divided to two groups comprised of those that received eight weeks of injectable vitamin B (a combination of B1, B6, and B12) and those on eight weeks of chewable tablets (a combination of iron, folic acid, vitamin B complex, and vitamin C). Finally, all patients were monitored for 10 months. Results: There were no statistically significant differences between the two groups in terms of deficiencies in ferritin, vitamin B12, and folic acid (P > 0.05). In the injectable form of treatment, the efficacy was excellent in 14, moderate in 12, and low in four patients while in the oral form, the efficacy was moderate in nine and low in 12 patients. It is important to consider that there was no response to treatment in nine patients. Conclusions: The injectable form of Vitamins B that contains a high dose of vitamin B had better efficacy than the oral form. Accordingly, it can be concluded that the injectable form of vitamin B might be an effective treatment as it is considered a simple, inexpensive, and low-risk treatment for patients with RAS, regardless of ferritin, vitamin B12, and folic acid levels. Recurrent Aphthous Stomatitis is a relatively common lesion, characterized by recurrent ulcers confined to the oral cavity. Its etiology is unknown, yet it seems to be a multifactorial disorder, developing in a specific favorable condition (1). Some studies suggested that RAS is usually caused by immune system impairment. In fact, it causes damage to the epithelial cells of the oral cavity. Following, the destruction of epithelial cells makes a T cell-mediated local response, and T cell and the tumor necrosis factor (TNF)-α produced by T cells may be involved in macrophages and mast cells. There are substantial shreds of evidence suggesting that the oral mucosa is mediated by these lymphocytes. However, causes of its onset are still unknown and complex. Also, various factors might be investigated in this regard to have a better understanding of RAS. Consequently, the immune system might also be impaired as a result of different reasons, such as trauma, nutritional deficiencies, hormonal effects, stress, infectious agents, immunological factors, blood abnormality, allergies, smoking stopping, and genetic predisposition. Most aphthous ulcers are seen in young children and adolescents, and nearly 80% of the affected people reported their first ulcer before the age of 30. Aphthous Stomatitis is clinically divided to three groups, including minor, major, and herpetiform. Minor Aphthous stomatitis is the most common type of Aphthous Stomatitis and has been observed in more than 80% of patients. Also, it is clinically a painful low-deep round to oval ulcer with a diameter of less than 5 mm. The ulcer surface is covered by a false white membrane with a clear margin and erythematous. These ulcers are typically developed in non-keratinized areas of the oral mucosa, including the lip, buccal area, oral cavity, ventral surface of the tongue, soft palate, and oropharynx. Minor ulcers are recovered within one to two weeks without scar. In major Aphthous Stomatitis, the lesion is usually greater than 1 cm and may even reach 3 cm. Deeper lesions usually last for up to six weeks, which may be recovered by leaving a scar. These lesions are associated with severe pain and sometimes end with fever and lethargy. Herpetiform Aphthous Stomatitis is not common, and shows the greatest number of lesions in addition to the highest number of recurrence. Also, it consists of several small painful ulcers, which are similar to herpes infection. In order to establish an appropriate diagnostic assessment to provide an effective treatment, another classification of these three lesions can be helpful. Accordingly, if in patients the number of lesions is low and they are recovered during one to two weeks and occasionally recurred, they would be considered as a simple aphthous. However, in patients with multiple aphthous, multiple ulcers (three or more) and almost permanent ulcers are developed, often when older lesions are recovered. Along with aphthous lesions in the mouth, they can also be found in the genital area. In this case, the patients should be examined in terms of inflammatory diseases, periodic neutropenia, vitamin deficiency (B12 and folate), and HIV infection (2). In general, aphthous is a painful and recurrent oral ulcer, which might interfere with nutrition, speech, and oral hygiene due to its painful nature. Hence, it can affect quality of live (1, 3). In the recent years, a number of papers have reported vitamin B12, folate, and iron deficiencies in these patients. Moreover, in several studies, researchers have indicated that deficiencies in vitamins, such as folic acid, B1, B2, and B6, are involved in the recurrence of pathogenesis (4). It was also revealed that 28% of patients with recurrence had a deficiency in one or more vitamins B group (3-8). Vitamin B group is a group of water-soluble vitamins playing an important role in the cell metabolism process. Therefore, they can increase metabolism, growth, and division of cells in the body. These vitamins are involved in proper functioning of the immune and nervous systems. More importantly, they are essential for skin and muscles health (9). Given all mentioned treatments and low success rate in identifying proper treatment methods to reduce the incidence of RAS, it was decided to assess the effects of injecting the B group containing high-dose of B vitamins (as there have been cases of treatment of diseases or reducing their symptoms with prescribing dose higher than the recommended daily intake of these vitamins) (10) on aphthous lesions and compare it with oral form of vitamins and nutritional factors, including folic acid, chewable vitamin C, iron tablet, and B complex vitamin. A randomized clinical trial was carried out on 60 patients with recurrent aphthous stomatitis, who were admitted to the skin clinic of Rasoul Akram hospital in Tehran during years 2016 to 2018. The minimum age of patients was 18 years. These patients experienced aphthous lesions almost every two months over the past year. The type of aphthous lesions considered in this research was minor. 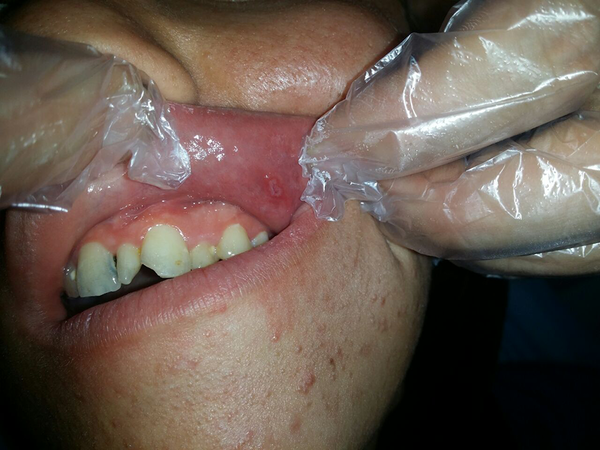 The patients included in the study had aphthous ulcers in the first three days. Exclusion criteria included having systemic problems (such as Behcet, inflammatory bowel diseases, chronic diarrhea, blood diseases, celiac disease, and other digestive symptoms), pregnancy, breastfeeding, and use of antibiotics and drugs with the potential of developing oral ulcers. Also, people, who had a history of allergy to the vitamin B group were excluded from the study. All patients were provided complete and accurate information on the details of the research and the way to implement it as well as possible complications. Then, based on the pre-prepared checklist, demographic information (age and gender), family history, smoking, frequency of recurrence, number of lesions, areas involved in the mucus, recovery time, and symptoms of diseases were recorded. The number of lesions and their recurrence, and symptoms of the disease and the recovery time were recorded at weeks two, four, six, eight, and ten months after treatment. Each patient underwent a blood test to examine the complete blood count (CBC), iron, ferritin, and vitamin B12. Then, patients were randomly divided to two groups based on a computer random number table. One group received the injectable form of vitamin B (Ravit Ampule manufactured by Raha company) (containing B1: 100 mg B6: 100 mg B12: 1000 μg) and the other group received oral form of treatment, involved daily intake of B complex tablet (including B1 + B2 + B6 + nicotinamide) one iron tablet, one folic acid tablet, and one chewable tablet containing 250 mg vitamin C. It is important to note that all of these tablets were manufactured by Daru Pakhsh company. Patients in the injection group were injected three times in the first week on separate days and two times from the second week to the end of the eighth week. Prescribed drugs were given to both groups of patients with time intervals of two weeks so that patients at the end of each two weeks were examined and the considered information was recorded. The efficiency of each group of treatments was measured by their potential in preventing recurrence and reducing the symptoms, number of lesions, and recovery time. High efficiency (without recurrence), moderate efficacy showing recurrence yet with reduced sequence, reduced recovery time, alleviation of symptoms, low efficiency (only alleviation of symptom), and lack of response were considered (11). The obtained results are expressed as mean and standard deviation (mean ± SD) for quantitative variables and as a percentage for qualitative variables. Quantitative variables were compared by the T-test, and if they were non-normally distributed, they were compared using the Chi-square test or Mann-Whitney test. Comparison of the qualitative variables was examined by the Chi-square test or Fischer’s exact test. Correlation between quantitative variables was examined using Pearson correlation coefficient and Spearman rank correlation tests. For statistical analysis of the data, SPSS 22 and SAS 9.1 software were used. The significance level was considered less than 0.05. In total, 60 patients were included in the study, 30 of which were placed in the injection group and the 30 others were placed in the oral group. The mean age of the patients in the two groups was 36.76 and 34.93, respectively, and no significant difference was found between the two groups in this regard. Based on Table 1, no significant difference was seen between the injection and oral groups in terms of primary indices, including gender distribution, family history, and smoking history. aValues are expressed a No. (%) or mean ± SD. Aphthous lesions were minor, and most of these lesions were seen in the labial and buccal mucosa. In the injection group, at the beginning of the study, 12 people had recurrence intervals of less than one month, and 18 people had recurrence intervals of more than one month. In the oral group, at the beginning of the study, 13 people had recurrence intervals of less than one month and 17 people had recurrence intervals of more than one month, with no significant difference seen between the two groups in terms of recurrence of lesions. Three out of 60 patients had low levels of hemoglobin and the rest were completely normal in terms of blood count. Deficiency in ferritin, vitamin B12, and folic acid in the injection group was 16.66%, 13.33%, and 13.33%, respectively, and the deficiency of these factors was 13.33%, 10%, and 6.66%, respectively, in the oral group, with no significant difference (P < 0.001) between the two groups. Also, comparing 60 healthy people without aphthous lesions with people with aphthous lesions showed that patients with aphthous had a lower level of vitamin B12 and ferritin and folic acid. With regards to the response to treatment in both injection and oral groups, a significant difference was seen between the two groups, so that the frequency of desired response in the injection group was significantly higher than that of the oral group (P < 0.001). In the present study, the recurrence intervals, number of lesions, recovery time (duration of healing of the lesions), pain and symptoms of discomfort were recorded qualitatively by a questionnaire from patients, and this information was graded according to Hardy’s study (11). In the high efficiency group, the patients were completely improved and thereby there was no pain and relapse. In moderate efficiency group, although there were recurrence periods, the relapse intervals and the time needed to heal and the severity of pain in patients was reduced compared with before the treatment. In the low efficiency group, there was no difference in the number of recurrences and duration of recovery and only the symptoms of discomfort like pain were reduced. Table 2 was developed based on the response of patients in the injection group. In terms of the number of lesions at intervals of treatment (in each recurrence), the mean number of lesions before treatment was similar in both groups. However, eight weeks after treatment and at the end of the tenth month, the mean number of lesions in the injection group was lower than that of the oral group (p value of less than 0.001). Based on Table 2, the mean intervals of recurrence events in the two groups was not different between the two groups before treatment. However, at two intervals of eight weeks after treatment and at the end of the tenth month, the mean number of recurrences in the injection group was significantly lower than that of the oral group (P < 0.001). At the end of the 10-month follow up, 14 patients in the injection group did not show any recurrence of aphthous lesions (Figures 1 and 2) and 12 patients showed recurrence. However, by reducing the sequence and recovery time and pain relief, lesions were observed. Four patients showed pain relief or reduced recovery time of lesions. In the oral group, nine people also showed reduced sequence of development of aphthous lesions and 12 people showed pain relief with or without reduction of recovery time of lesions, and nine others did not respond to treatment. In the injection group, during the two-month period, 60% of the patients experienced lesion-free periods, and 46% of the patients showed no recurrence at intervals of two to ten months. In the oral group, during the two-month period of treatment and the follow-up period, patients with aphthous recurrence showed lesions. The reduced sequence of aphthous lesions in 40% of the patients during the two-month period of treatment was in the form of incidence of a single lesion (based on recurrence sequences before treatment), and during the period of two to ten months, 30% of these patients maintained this reduction of the sequence. Figure 1. Vitamin B injection group. 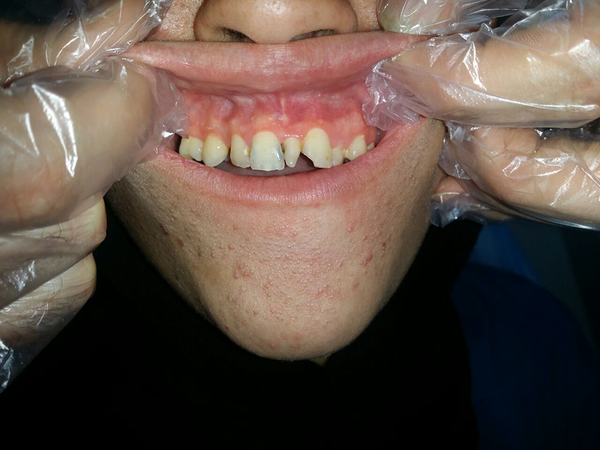 *Patient had lesion in the labial mucus before the treatment. A comprehensive medical research conducted from 1951 to 2009 showed 578 papers related to the treatment of aphthous lesions including 110 clinical trials. Medical interventions ranging from plant medicine to multivitamins, cohesive pastes, topical antiseptics, systemic and topical antibiotics, topical non-steroidal anti-inflammatory drugs and topical and systemic immune-modulators, immune-suppressors, and corticosteroids were among treatments prescribed for aphthous patients. Many of these treatments achieved short-term goals, such as pain relief, reduced number of ulcers, and size and duration of recovery in ulcers. A few of these studies could achieve long-term goals, such as reducing the recurrence of lesions and maintaining the suppression of disease (29). Furthermore, B vitamins are soluble in water and are not stored in the body. They can be received through eating or in the form of a diet supplement. These vitamins act as a coenzyme in the metabolism of carbohydrates, proteins, and fatty acids. This research evaluated the effect of injected vitamin B in comparison with oral treatment on aphthous stomatitis in patients admitted to skin clinic of Rasoul Akram hospital in Tehran during 2016 to 2018. As stated above, in a number of patients with recurrent aphthous stomatitis, a potential effective factor that caused lesions was a deficiency of vitamins and minerals, such as lack of iron, folate, vitamin B12, and zinc. Some studies have shown that alternative treatments with minerals and vitamins can bring satisfactory treatment (5-7). By reviewing studies on recurrent aphthous stomatitis, it was assumed that people, who suffer from recurrent aphthous stomatitis show deficiency in B group vitamins (3-8). This research evaluated the effect of the injected form of vitamin B compared to that of the oral form of vitamin B on recurrent aphthous stomatitis. The current research showed no significant difference between the two groups in terms of ferritin, vitamin B12, and folic acid, yet the injected form of vitamin B showed a better effect in terms of reduction of recurrence and the number of lesions and the time of recovery of lesions and mitigation of symptoms. In the research conducted by Piskin et al. only the serum level of vitamin B12 was statistically lower in patients with aphthous. It was concluded that vitamin B12 deficiency might be involved in etiology of recurrent aphthous stomatitis (12). The results of the research conducted by Kozlak showed that patients with recurrent aphthous stomatitis had an inadequate daily intake of vitamin B12 and folate compared to the general population. The exact mechanism of the effect of vitamin deficiencies on recurrent aphthous stomatitis is not known. Studies have indicated that the response to alternative treatment in a number of people have had a direct effect on oral mucosa, confirming the hypothesis that deficiency is an underlying factor for ulcers and vitamin B12 acts as a coenzyme in the metabolism of lipids and carbohydrates, and the synthesis of protein and blood cells. Recent research has indicated that changes in the oral mucosa, including glossitis and stomatitis, might be clinical symptoms of primary deficiencies of vitamin B12 or folic acid (7). In the research carried out by Khan et al. (3), blood deficiencies were higher in patients with recurrent aphthous stomatitis. Deficiencies in serum ferritin, serum vitamin B12, and red blood cell folate were significantly higher in patients than that of healthy people. In the research conducted by Olson et al. (13), no significant difference was found between hematological parameters in patients with aphthous and healthy people, and these results were inconsistent with those of the current research, which examined these parameters in patients and healthy controls. Since some reports indicated that about 18% of patients with recurrent aphthous stomatitis are diagnosed with deficiencies in vitamin B12, folate, or iron, the hypothesized relationship between recurrent aphthous stomatitis and hematological disorders has been discussed (6, 14). This suggests the importance of blood examination in diagnosis and treatment of patients. Olson et al. found that blood deficiency is common in people with recurrent aphthous stomatitis. In their research, anemia was not found in any of the patients with aphthous stomatitis, while 11.6% of aphthous patients and 4.9% of the control group showed low levels of iron. Moreover, the mean serum ferritin level was significantly reduced in patients with recurrent aphthous stomatitis. The research revealed that while patients with recurrent aphthous stomatitis rarely had anemia and usually had normal levels of vitamin B12, iron, and folate red blood cells, they might have lower levels of vitamin B12, serum ferritin, and folate compared to other patients. This is in line with the results of the current research, which showed that while patients with recurrent aphthous stomatitis (RAS) usually have normal levels of vitamin B12, ferritin, and folic acid, they have lower levels of vitamin B12, ferritin, and folic acid compared to normal people. The research conducted by Wary et al. showed that topical treatments led to improvement until the treatment process continued (14), however, after the end, aphthous ulcers reappeared. Also, these treatments could not reduce the intervals and recurrence of the lesion. In 23 patients with deficiency of ferritin, folic acid, and vitamin B12, alternative treatment led to a better response by patients to treatment. In the current research, as recovery was observed in both interventional groups, one can consider the important role of alternative and systemic treatments in the improvement of aphthous lesions. Many studies have reported cases of nutritional deficiencies in patients with aphthous (12, 15, 16). The research conducted by Porter et al. showed low levels of ferritin in 11.6% of aphthous patients, while vitamin B 12 levels were 3.2%. In the research carried out by Challacombe, in which 193 patients with aphthous lesions in London were examined, 7.3% of the patients were anemic (17). Piskin et al. (12) showed that only serum vitamin B12 levels were significantly higher in patients with recurrent aphthous stomatitis compare with those in the control group (P < 0.005). In the current research, 5% of patients with aphthous were anemic, while nutritional deficiencies were 41.6%, which indicates similarities and differences with the mentioned studies. These differences might be due to differences in race and place of residence of the patients. The research conducted by Noaln et al. showed that vitamin B1, B2, and B6 deficiencies should be considered as an exacerbating factor in recurrent aphthous stomatitis (4). They also believed that vitamin B levels should be measured, yet if such measurements are impossible, alternative vitamin B treatment would play a major role in the treatment of patients. This result was consistent with that of the current research, which showed better results in injected forms of vitamin B compared to the oral form. In the current study, high doses of vitamins B1, B6, and B12 were used and its positive results were seen. The results of the study conducted by Volvok showed that treatment with vitamin B12 reduces pain, the number of lesions, and the duration of recovery of aphthous lesions. These results did not depend on base levels of vitamin B12. Although deficiency of vitamin B12 in the current research was seen in 13.3% of patients, yet recovery was seen in a great number of the patients; these results are in line with those of the current research. This might be due to non-measurement of other vitamin B group, and the possibility that deficiencies of vitamin B12 have not been accurately determined, since values of methylmalonic acid (MMA), homocysteine (HCY), holotranscobalamin II (holoTC) were not checked. Furthermore, HCY, MMA, holoTC were measured to increase the sensitivity and specificity of diagnosis of vitamin B 12 disorder. HoloTC is biologically a spectrum of active vitamin B12, increasing the uptake of vitamin B12 by cells. While diagnostic algorithms using vitamin B12 (MMA and HCY measurements) have been reflected in studies of some universities and scientific centers, negative predictive values have not yet been proven. Hence, the diagnosis and measurement of deficiencies of vitamin B12 are still controversial. Another explanation for the effectiveness of vitamin B12 in the treatment of aphthous lesions is that the vitamin B12 function is unique, yet it has not been yet known (5, 18). In a report released by Weusten and van de Wiel on aphthous lesions and vitamin B12 deficiency, in three patients with problems of anemia, Borborygmia, and Graves’ disease, who had vitamin B12 deficiency, the lesions were recovered by prescribing this vitamin. They concluded that deficiency of vitamin B12 should be considered in patients with a history of aphthous lesions (19). Given the recovery results in patients of the current research in injection and even oral form, the role of vitamins B1 and B6 deficiency in increasing the sensitivity and pain of oral mucosa and inflammation of the tongue and lips is emphasized (20). The exact role of group B vitamins has been discussed in the pathogenesis of recurrent aphthous. Further studies are required to clarify the importance of group B vitamins in recurrent aphthous stomatitis. 1. Ujevic A, Lugovic-Mihic L, Situm M, Ljubesic L, Mihic J, Troskot N. Aphthous ulcers as a multifactorial problem. Acta Clin Croat. 2013;52(2):213-21. [PubMed: 24053082]. 2. Neville BW, Damm DD, Chi AC, Allen CM. Oral and maxillofacial pathology. Elsevier Health Sciences; 2015. 3. Khan NF, Saeed M, Chaudhary S, Khan NF. Haematological parameters and recurrent aphthous stomatitis. J Coll Physicians Surg Pak. 2013;23(2):124-7. [PubMed: 23374516]. 4. Nolan A, McIntosh WB, Allam BF, Lamey PJ. Recurrent aphthous ulceration: vitamin B1, B2 and B6 status and response to replacement therapy. J Oral Pathol Med. 1991;20(8):389-91. doi: 10.1111/j.1600-0714.1991.tb00950.x. 5. Volkov I, Rudoy I, Freud T, Sardal G, Naimer S, Peleg R, et al. Effectiveness of vitamin B12 in treating recurrent aphthous stomatitis: a randomized, double-blind, placebo-controlled trial. J Am Board Fam Med. 2009;22(1):9-16. doi: 10.3122/jabfm.2009.01.080113. [PubMed: 19124628]. 6. Wray D, Ferguson MM, Mason DK, Hutcheon AW, Dagg JH. Recurrent aphthae: treatment with vitamin B12, folic acid, and iron. Br Med J. 1975;2(5969):490-3. [PubMed: 1148667]. [PubMed Central: PMC1673414]. 7. Kozlak ST, Walsh SJ, Lalla RV. Reduced dietary intake of vitamin B12 and folate in patients with recurrent aphthous stomatitis. J Oral Pathol Med. 2010. doi: 10.1111/j.1600-0714.2009.00867.x. 8. Lopez-Jornet P, Camacho-Alonso F, Martos N. Hematological study of patients with aphthous stomatitis. Int J Dermatol. 2014;53(2):159-63. doi: 10.1111/j.1365-4632.2012.05751.x. [PubMed: 23879674]. 9. Scully C. Oral and maxillofacial medicine: the basis of diagnosis and treatment. 1. Churchill Livingstone Elsevier; 2008. 10. Ralapanawa DM, Jayawickreme KP, Ekanayake EM, Jayalath WA. B12 deficiency with neurological manifestations in the absence of anaemia. BMC Res Notes. 2015;8:458. doi: 10.1186/s13104-015-1437-9. [PubMed: 26385097]. [PubMed Central: PMC4575440]. 11. Hardy C. Safety and Efficacy of Colchicine in the Treatment of Recurrent Aphthous Stomatitis. 2011. 12. Piskin S, Sayan C, Durukan N, Senol M. Serum iron, ferritin, folic acid, and vitamin B12 levels in recurrent aphthous stomatitis. J Eur Acad Dermatol Venereol. 2002;16(1):66-7. [PubMed: 11952294]. 13. Olson JA, Feinberg I, Silverman SJ, Abrams D, Greenspan JS. Serum vitamin B12, folate, and iron levels in recurrent aphthous ulceration. Oral Surg Oral Med Oral Pathol. 1982;54(5):517-20. [PubMed: 6960305]. 14. Wray D, Ferguson MM, Hutcheon AW, Dagg JH. Nutritional deficiencies in recurrent aphthae. J Oral Pathol Med. 1978;7:418-23. 15. Porter SR, Scully C, Flint S. Hematologic status in recurrent aphthous stomatitis compared with other oral disease. Oral Surg Oral Med Oral Pathol. 1988;66(1):41-4. [PubMed: 3165514]. 16. Challacombe SJ, Barkhan P, Lehner T. Haematological features and differentiation of recurrent oral ulceration. Br J Oral Surg. 1977;15(1):37-48. [PubMed: 268215]. 17. Challacombe SJ, Scully C, Keevil B, Lehner T. Serum ferritin in recurrent oral ulceration. J Oral Pathol. 1983;12(4):290-9. [PubMed: 6411882]. 18. Volkov I, Press Y, Rudoy I. Vitamin B12 could be a "master key" in the regulation of multiple pathological processes. J Nippon Med Sch. 2006;73(2):65-9. [PubMed: 16641529]. 19. Weusten BL, van de Wiel A. Aphthous ulcers and vitamin B12 deficiency. Neth J Med. 1998;53(4):172-5. [PubMed: 9825643]. 20. Ghom AG, Ghom SAL. Textbook of oral medicine. JP Medical Ltd; 2014.